Foothill Blvd. & Oak Grove Dr.
Multi-terrained, oak lined course. World's 1st permanent polehole course. Requires a wide range of shots. #6 is out part of the summer (a summer camp permits that area). The infamous "Spider" hole - a alternate hole - is inserted uphill of 4's fairway while #6 is out. 210 Fwy, exit Berkshire Dr., turn east off ramp to a left at stop light. Go past La Canada High to a right turn into the park, take next left downhill, to a right at stop sign. Current 1st tee (original #10) at corner behind ball field backstop, but historical Gophers prefer if you start at the Original First Tee (current #10). Hard to beat OG. Even without its historical significance, it stands on its own as a solid course. It includes diverse variety of shots including wooded holes, uphill and down hill throws, water obstacles (when it rains). Dedicated club creates a vibrant community around this special place. Best course in LA area. This was my home course while I lived there. Very challenging. Acorn Liqour, just down the street, has a great selection of discs. Played my very first round of disc golf here with my uncle. Him and his friends used to play here every week, 15 years ago. Great coasre to play. Great for begginers. 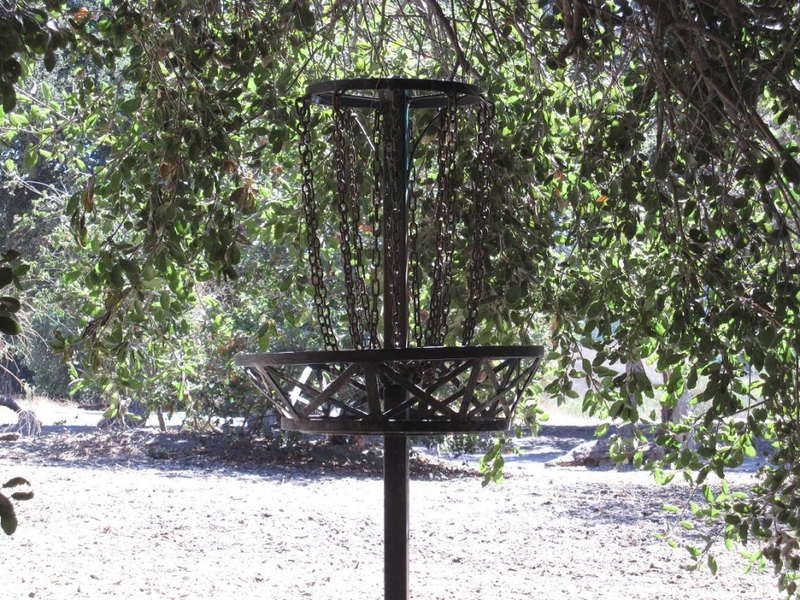 Basket 11 with the dog leg is great, and the D basket across the ravine is challenging and fun. Theres alot of trees, obstacles, and some mandatories, make it even more fun, and some of the baskets are moved around sometimes. Exellent coarse to play. Definateley gets a 5. Historic first DG course, gotta love it for that. Pretty good variety of holes, some with trees like East Coast. Let's be honest here. Not a 5 (or a 4?) course by any stretch of the imagination, but the Grove has its charm and of course its history. Dusty and hot in the summer - pretty in the winter. Oak trees to navigate and some interesting locals. An active club and one of the longest running events in the sport (the Horns' Wintertime Open). A "must play" list of courses in So Cal would include the adventurous Coyote Point in Ventura and a drive up to the mountainous Sunrise at Mtn. High in the summer. La Mirada has classic rolling grassy hills and length and Sylmar (also best in the winter) is fun too. You might also include Chavez Ridge with its interesting gnarly hillsides and Dodger Stadium views. Oak Grove belongs on the play list for the visitor as well - in part due to the history of the course and the proximity to southland tourist charms like Old Town Pasadena, the Gamble House and the Norton Simon Museum. I love this course. This is the first course I played in SoCal after moving from Michigan and it's still my favorite. While it's a short course there are many trees and other obstacles to make it interesting. Play here is casual and rarely have I had to wait at holes unless it was a planned pit stop. The signage is nonexistant but that's really only an issue the first time you play here. Otherwise, the holes can vary from one day to the next as nearly every hole has more then one pin placement. Also take note of where the regulars walk to as sometimes there is an extra few holes to play that aren't regular holes, but often are very fun. It can get very dry and dusty, but it can also be teeming with thick growth as well. So while it may not be the toughest, grandest or most spectacular course you can play, overall I feel it gives enough of everything to loft it above most courses I've played. I give it two because that is what it deserves as a course. There are other courses not too far away that will offer challenging golf. Clearly the history is there and important. This is why I made sure to play it while I was in LA from the east coast. Short course, not well signed, great beginner or casual course. Can be crowded as the back nine is very compact. Lack of signs on front nine is frustrating. Stunning panorama that is a treat for a Delaware boy. This is OAK GROVE, don't know why they changed the name. I've been playing here since I was a teenager, over 35 years now. When I started there we threw big WHAMO dinner plates (and still managed negative scores! ), the park has changed a lot since then. The back nine used to be the front nine. The homeless guy on the back 9 near the bathrooms has been there quite awhile. There was a bathroom near 3rd hole that burned down, idiots. It can get crowded during peak times, and it is dusty, the only 2 reasons I don't give it 5 links. Excellent course. Oak Grove is one of my favorites because of the history. Its the first course I ever played at, and is also a challenging course because of the thick (oak groves).The front 9 is not as rough as the back.Some long holes on the back and a bit dusty. Be sure to bring snacks and drinks, and enjoy the park atmosphere. Another advantage is the lack of a crowd, making for a relaxed game.